In steps, it is only about .5 miles from the trailhead to Steelhead Falls. In terms of geologic time, it is a few million years. Colorful grooves decorate cliffs and show the erosion of time. Wildflowers dot the slopes in the spring and golden eagles soar overhead. The trail to the falls is relatively easy, with one small, steep section. Hike down for a picnic, fish in the Deschutes River, explore the rocky shores, or just sit and relax and let the sound of the falls erase the world around you. The Deschutes Canyon-Steelhead Falls Wilderness Study Area (WSA) (OR-5-14) is part of a larger study area that includes U.S. Forest Service lands. This WSA is located in a triangle formed by the towns of Madras, Redmond and Sisters, in Central Oregon. The Steelhead Falls study area is a long narrow area located along the upper Deschutes River, within and adjacent to the U.S. Forest Service-administered Crooked River National Grasslands. Open for overnight camping, sites are first come first served. Amenities include limited trailer parking and an outhouse, but no potable water. Campfires are allowed; fire restrictions are in effect in the summer. 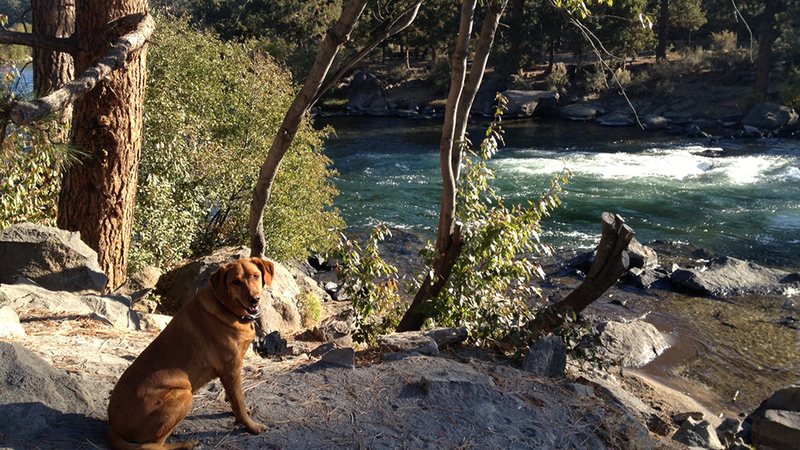 Pets should remain under owner control at all times and leashed at the trailhead and in the camping area. Watch where you put your feet and hands, rattlesnakes can hide around rocks and under brush! Need more trail time before heading home or setting up camp? Take the Foley Waters trail off the south end of the Steelhead Falls parking lot for some more views! Trails from Steelhead Falls trail head will take the fisher to a series of deep runs to a pocket water section to another series of deep pools and broad runs. This is a year round fishery with a 2 fish limit for Red Band and No limit on the number of Brown trout. Top water fishing can be productive for smaller fish but you will need to go deep for the trophy browns. Standard mayfly patterns are productive midday from March into July, but watch for the March Browns and Salmon flies in the Spring. Caddis action from late summer into the fall. River levels are critical, so check for flows on the Deschutes “below Bend” of less than 400 cfs.